As we draw closer to the world's first plain packaging law which takes effect from 1 December 2012 in Australia, the issue of plain packs is again starting to heat up. 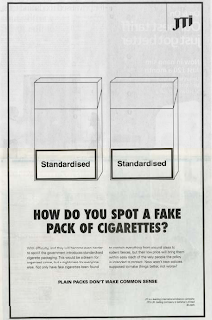 Businessweek.com suggests that the law which was passed earlier this year requiring tobacco companies in Australia to sell cigarettes in plain packaging could "set a precedent for other countries to follow". British American Tobacco (New Zealand) Limited is not alone however. 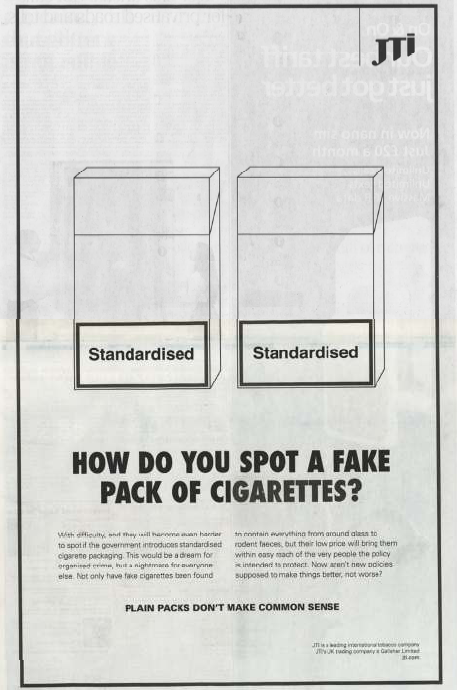 Today (Monday 8 October) Japan Tobacco International (JTI) took a full page ad in the UK’s Daily Telegraph with the headline “How do you spot a fake pack of cigarettes?”.